In Melee, anytime during the first 2 frames of activation, powershielding will reflect any projectile, even ones that have already been powershielded. A powershield (ジャストシールド, Just shield) (officially called perfect shield in Brawl onward) is a technique where one activates a full shield such that it connects with an incoming attack on the first few frames. In order for the technique to be executed, one must rely on timing and skill. When the opponent is ready to strike, the player must quickly use the shield. If done correctly, the character takes no shield damage (or shieldstun if a projectile was powershielded) and may immediately perform a counterattack while the attacker is stuck in hitlag. The powershield technique in Melee, Brawl, SSB4 and Ultimate is comparable to a parry in traditional fighting games, as it results in little to no knockback and freezes the opponent for a couple frames. Powershielding up through SSB4 is done by quickly and fully depressing a shield button four frames before an attack connects. If done correctly, there will be a significant flash on the shield and a distinctive "chlink" sound (with the exception of SSB4, where a softer sound plays instead). Because it is technically a shield, it is ineffective against grabs. In Melee, powershielding can reflect projectiles during the first two frames, although they deal half their usual damage (unlike other reflectors, which increase their damage), and Poké Balls reflected in this way retain the ownership of the character that threw them. In Brawl and SSB4, perfect shielding merely redirects projectiles at an angle without changing their ownership. 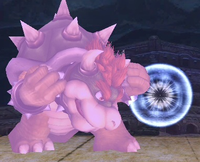 In Ultimate the method has been reversed; after a shield has already been raised, perfect shielding is done by releasing the shield button immediately before an attack connects. If performed correctly the defending character will flash. Both characters will enter hitlag, but the defending character is still able to recover much quicker for a counterattack. CPU players, especially level 9s, use this technique a lot to reflect projectiles in Melee and against any incoming attack in Brawl and SSB4. Human players don't use it as much simply because of the reaction times and precision usually required, and as such, it often comes as a surprise and can momentarily disrupt a match. However, it has been made easier to take advantage of in Brawl and SSB4 than in Melee due to the ability to drop one's shield twice as fast. At high level play, powershielding in Melee can be used to reflect a wave of incoming projectiles such as Falco's laser, to punish camping. 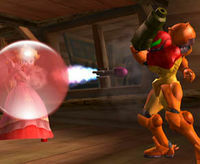 Peach reflecting Samus's Missile via powershielding in Melee. In Melee, the technique is known as power shielding (named for the Power Shielder bonus attained by using the technique multiple times). Power shielding is accomplished by fully pressing L or R such that the shield appears just before the incoming attack hits the player. More specifically, the full shield bubble's inner reflection hitbox must connect with the hitbox of the incoming attack within 4 frames of activating the shield. The noise heard by doing this is rather quiet compared to Brawl's, and should a projectile hit on frames 1 or 2 of the powershield, the technique will reflect projectiles at half the original damage. Though the technique is difficult to perform consistently, powershielding is extremely valuable in competitive play, as it allows players to punish moves with low ending lag such as Fox's neutral aerial. Its ability to reflect projectiles is even more valuable as it allows players to punish otherwise safe, predictable projectile spam, particularly in the Falco matchup, whose lasers can shut off many options and leave a player completely helpless if not dealt with properly. Though extremely difficult, powershielding projectiles is still humanly possible to perform consistently. Players who use characters with projectiles often have an easily trackable firing pattern, such as firing projectiles only when there is a certain distance between the players. It is also important to note that players (again, Falco mains in particular) will short hop to move while firing. As such, a projectile user running or jumping away from pressure is often a surefire sign they intend to fire. If the projectile is thin like Falco's laser, another thing a player can do to ease the risk and timing needed to powershield is to crouch and wait for the projectile to pass over the character. Shielding while the projectile is directly over the character will ensure a powershielded projectile. Powershield follow-up is also distance dependent. A laser is considered safe if fired when Falco and his opponent are standing a distance X between each other, where X is the max horizontal distance Falco can jump in 1 short hop. At this distance, powershielding the lasers yield no follow ups and attempting to move around them by jumping, rolling, or going under them with attacks that lower hurtboxes (like Marth's dash attack) put the opponent in positions Falco has an easier time winning neutral in. However, if the laser is fired too far away, for example at distance 1.5X, the laser is not safe, as powershielding does yield follow-ups such as a grab. Due to quirks in Yoshi's shield, Yoshi sometimes powershields attacks even when the shield is already up. This however only works against melee attacks, not projectiles. GuardReflect is triggered. Reflecting projectiles is possible during the first two frames. During the first four frames, physical attacks will enable the subsequent cancellation of the GuardOff animation. Both are only possible if the incoming hitbox also overlaps the inner powershield sphere on the first frame of its collision with the shield. 1.1 If a projectile collides with the powershield sphere during the first two frames, it will get reflected. This has no effect whatsoever on the GuardReflect animation – it will play on just as if nothing had hit the character or his shield. Thus, physical powershields are still possible after a projectile has been powershielded. 1.2 If a physical hitbox collides with the powershield sphere during GuardReflect 1-4, the powershield sound and graphical effects are played and the GuardOff cancellation is stored. 1.2.1 If the first physical powershield was triggered before the 4th shield frame, subsequent hits up until the 4th shield frame will trigger the sound and graphical powershield effects once more. This does not provide an additional benefit, though. 1.2.2 If GuardDamage (the animation usually referred to as shieldstun) is interrupted by another hitbox colliding with the shield, the shielding character undergoes shield hitlag and subsequent shieldstun once more. This does not affect the eventual ability to interrupt GuardOff, even if the shielding character get hits by many attacks while in shield and experiences very long shieldstun. 1.2.3 As soon as GuardDamage is over, the character will enter his indefinite Guard animation if he still holds down a shoulder button. If he doesn't keep L, R or Z pressed, he will enter the GuardOff animation. 1.2.3.1 If the character immediately transitioned from GuardDamage to GuardOff or didn't spend more than 3 frames in the Guard animation before dropping his shield, the possibility to cancel GuardOff will still be available. GuardOff has a total animation length of 15 frames and can be interrupted by any action that can be triggered with the buttons A, B, X, Y and Z as well as with the C-stick. Additionally, grabbing with (L∨R)∧A, jumping with ↑ and spot dodging with ↓ on the control stick are possible. Up tilt and down tilt are only possible by keeping them pressed from at least 4 frames before the start of the GuardOff animation – otherwise, the input will still count as a smash input and trigger jump or spot dodge. GuardOn is triggered. This animation has no powershield sphere, but the shield sphere is active from the first frame on as well. It can be transitioned to GuardReflect by a digital shoulder button press only on frame one and only if no hitbox collided with the shield on this first frame. 2.1 If a digital press occurs before GuardOn 2, the GuardReflect animation will deviate from its normal behavior. During its first two frames, only projectiles are shielded (and reflected). Physical attacks hit the character just as if he wasn’t shielding at all. On GuardReflect 3-4, both the normal shield sphere and the powershield sphere are active. AttackAirLw 5: First active frame of Fox's dair. On this frame, Marth presses R digitally and immediately triggers a powershield. This frame is then repeated three times ("hitlag") during which Marth may use shield smash DI. AttackAirLw 6: The initial dair hitbox is still active. Because Marth's shield has already been hit by it, there is no collision on this frame. AttackAirLw 7: No hitbox is out on this frame. Marth is still in shieldstun. AttackAirLw 8: The second kick hitbox comes out. Because this is still the 4th frame of Marth's GuardReflect (the entire shield hitlag is counted as only one frame), the powershield sound and graphical effects are triggered again. Later kick hitboxes cause normal shield hitlag and hitstun without the powershield effects. After Fox lands on the ground, Marth will transition into GuardOff if he does not press any shoulder buttons anymore and can cancel it after GuardOff 0 with any ground attack. If he still holds L/R down after GuardDamage, he needs to let go after 3 frames of Guard in order to not lose the cancellation option. Here, up tilt was not an optimal choice, as on the frame its hitbox came out, Fox was just out of landing lag and could have shined. If he had done so, it would have collided with the up tilt hitbox, so Marth would still not have got hit. Bowser perfect shielding an attack in Brawl, creating a collision bubble where it was blocked. The ability to powershield returns in Brawl, now officially known as a perfect shield. It works similar to Melee, but with a few notable differences. One major change is that perfect shielding no longer reflects projectiles; should a projectile connect during perfect shield frames, they will rebound off the shield at an angle instead of rebounding back towards the owner of the projectile. A projectile that bounces off a character's shield can no longer affect that character unless it's a multi-hit attack. Additionally, perfect shielding a melee attack now incurs decreased shieldstun and no shield pushback. Lastly, a clear "clang" sound occurs when a perfect shield is executed. Mario perfect shielding Dr. Mario's Fast Capsule. In Smash 4, perfect shielding initially worked the exact same way as in Brawl. As of update 1.1.1, however, its action time was reduced from 4 frames to 3 frames, making it more difficult to perform, though this is compensated by perfect shielding now reducing shieldstun (which has been made much higher by the update) by 25%, making it more rewarding when executed effectively. Perfect shielding in Smash 4 also produces a quieter sound effect than in Brawl; Ryu is an exception to this, as he instead uses a unique perfect shield sound effect based on the parry in Street Fighter III. Mario perfect shielding the third hit of Young Link's neutral attack. Perfect shielding in Super Smash Bros. Ultimate functions completely differently than in previous games. It now requires the player to release the shield button when an attack connects against their shield, instead of the other way around, essentially functioning as a parry. Additionally, perfect shielding in Smash Bros. Ultimate is significantly more dramatic, pausing the screen and causing it to flash while the perfect shielder's eyes glow. Perfect shielding an attack from different attackers causes the user to perfect shield multiple times from a single parry. Each character also performs a new animation upon successfully perfect shielding, similar to Ryu's parry animation from Smash 4. Ryu keeps his unique sound effect and now shares it with Ken. The Perfect Shield on the DOJO!! This page was last edited on April 21, 2019, at 08:26.